RED HOT VAR’S SON A SURE HIT! Boland Stud will be offering this magnificent colt by last season’s Champion Sire of 2YO’s Var at the 2018 Emperors Palace National Yearling Sale at the end of April. Lot 211 is a beautifully bred chestnut colt -who hails from one of the best families in the stud book. 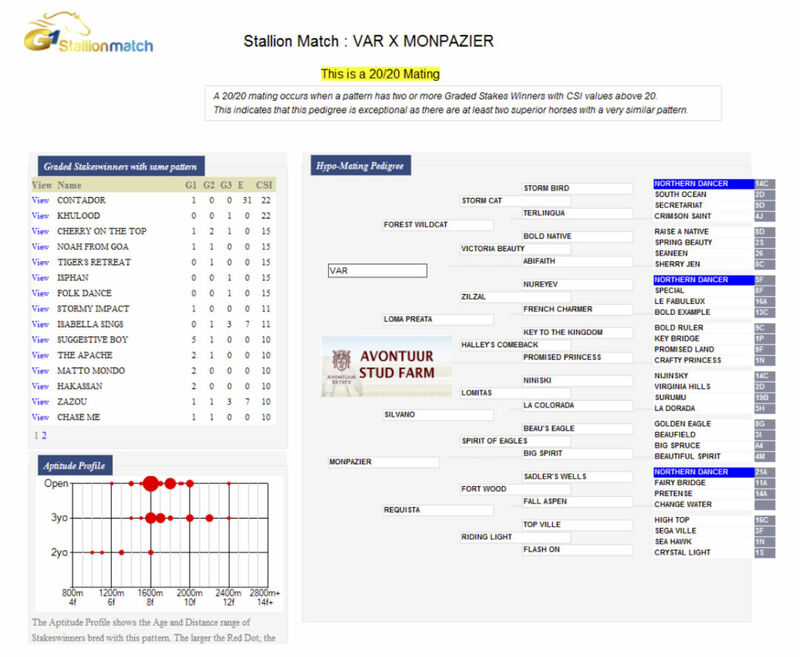 His Gr.1 winning sire Var appears on track to defend his title as South Africa’s Champion Sire of 2YO’s. The son of Forest Wildcat, also responsible for the first two finishers in the recent Listed Lady’s Pendant, is currently well clear on the Two-Year-Old Sires List. Among the impressive two-year-old winners to have represented Var this season so far is Doug Campbell’s unbeaten filly Val-La-Ree (winner of both her outings to date) debut winner William The Silent (who hails from the Robbie Sage yard), and the Vaughan Marshall trained Zinedine. The latter made a stunning winning debut recently when romping home by five lengths and is considered a candidate for the Gr.1 Gold Medallion (a race won by Var’s son Villandry in 2009). Sire of 20 Gr.1 horses to date, Var has also proved a huge hit in the sales ring, with his yearlings fetching up to R5 000 000. His son, lot 211, is out of a winning Silvano half-sister to five winners, including Gr.3 Jacaranda Handicap winner Aquitaine and the remarkable Captain America. 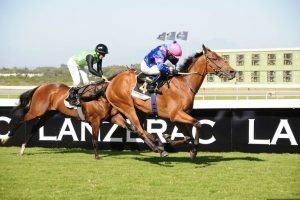 The latter, whose wins include the Gr.1 H F Oppenheimer Horse Chestnut Stakes and Gr.1 Rising Sun Gold Challenge, has banked more than R5.3 million and has won or placed in 12 Gr.1 races! 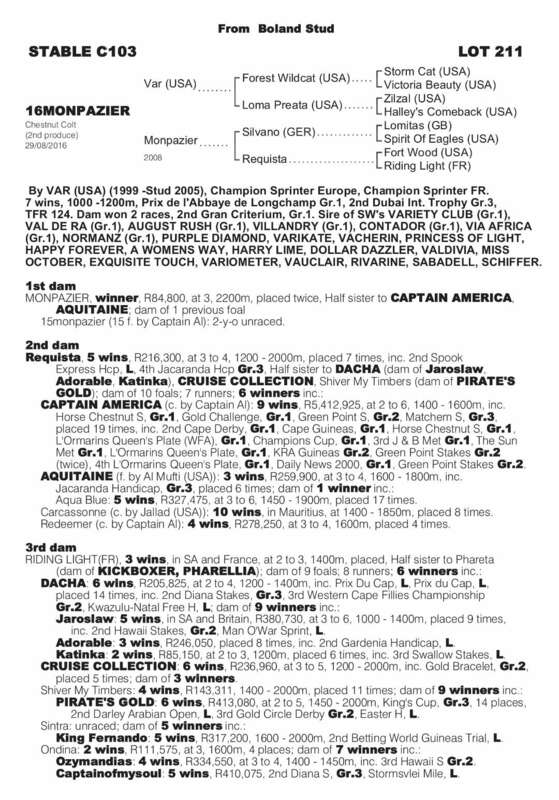 Redeemer, a full-brother to Captain America, has won three in a row and looks progressive. 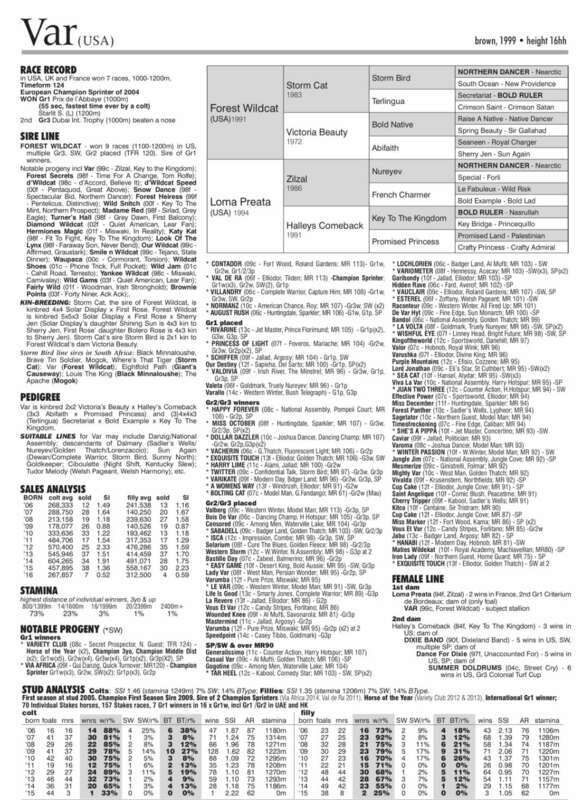 Second dam, Requista, (by champion sire and broodmare sire Fort Wood) won five and was second in the Listed Spook Express Handicap. Her sire Fort Wood is broodmare sire of Var’s Gr.1 winning sprinter Contador. This is the great Queen Of Light family responsible for numerous Gr.1 winners throughout the world. 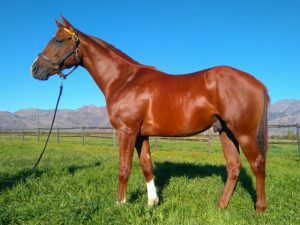 This colt’s broodmare sire Silvano is fast making a name for himself as a damsire, with Silvano the maternal grandsire of high class stakes winners Wonderwall, Cosmic Light, Louisiana, Goodtime Gal and Joking. This colt has been bred on a similar cross to the one that produced Gr.1 winner Contador who is also by Var. Boland Stud invites you to make an excursion to Ceres to view their impressive draft of yearlings for the BloodStock South Africa National Yearling Sale 2018. From today, until Thursday 12th April 2018 at a time suitable to you. To schedule your visit please contact Eugene Freeman on 084 816 3741 or email him at eugenefreeman@bolandstud.co.za. Make a day or a long weekend of your trip and come and enjoy all that the beautiful Ceres valley has to offer. We look forward to the pleasure of your company. 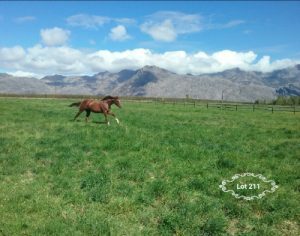 From Sunday 15th April, yearlings will be at the TBA Complex in Johannesburg for viewing.